A pure silver coin given to Rand, Mat, and Perrin in The Eye of the World, it features Siuan Sanche holding a flame, flanked by seven stars and wearing the stole of the Amyrlin Seat. The reverse features the ancient symbol of the Ouroboros, the snake eating it's own tail, used to symbolize eternity. In the center is the Flame of Tar Valon, official symbol of the White Tower and the Amyrlin Seat. "Most men outside Tar Valon get rid of those as fast as they can. Unless they serve the Tar Valon witches." The framable document with coin comes in a 9? x 11.5? hard plastic top-loader sleeve for protection. 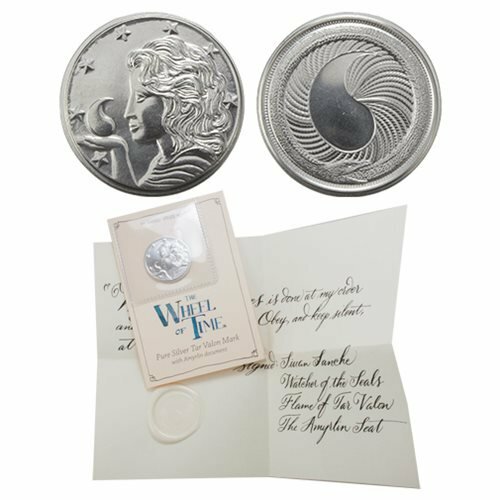 The coin is made from one 1/4 troy ounce of 99.9% pure silver one at a time in the USA using antique coining equipment and traditional techniques. The set comes with an information sheet with the history of the coin.Officially licensed merchandise.